White Space Art Asia presents Elegance of Absence an exhibition that explores the complex relationship of negative space in art. Negative spaces – or things that are caught between presence and absence – are often overlooked when it comes to Chinese paintings. Yet, they are fundamental to the Chinese philosophy and have always been a major part of the artistic ethos. They play the important role of an amplifier, accentuating the works such that abstractions and emotions that are conveyed through these spaces are enhanced by means of absence, rather than presence. Negative spaces convey meaning through the lack of an image. The very absence creates rhythm and balance. Absence is not a negation but rather, it defines and it elucidates. The image may be specific to context, but the language of negative space is a universal one. Negative spaces are not simply vacant of content, but rather, they are their own content and they embody multiple meanings. It is a blank canvas for viewers to impose and to project their preconceived ideas and bring their subjectivity to the painting so that an evolving dialogue occurs between the work and the audience. Indeed, the nature of negative space is personal but with a kind of universality that allows viewers to partake in the spiritual experience. It results in a shared spiritual intimacy that exists between the art, the artist and the viewer. The utilisation of negative space in these works are a seedbed for the sowing of the seeds of strong emotions and in particular, a distinctive feeling of familiarity that is at the same time, marked by an understated hint of detachment – which accentuates the imaginative invocation of nuanced atmospheres and moods particular to different works. Negative spaces do not exist as empty vacuums, they create a space for the mystery, the unknown, and the hidden. In fact, these “empty” spaces are paradoxically full of life and energy. Indeed, that which is unpainted gives meaning to the painted. If the multitudes of the artworks could be weaved and summed up into a single idea, then it would be that of introspection. 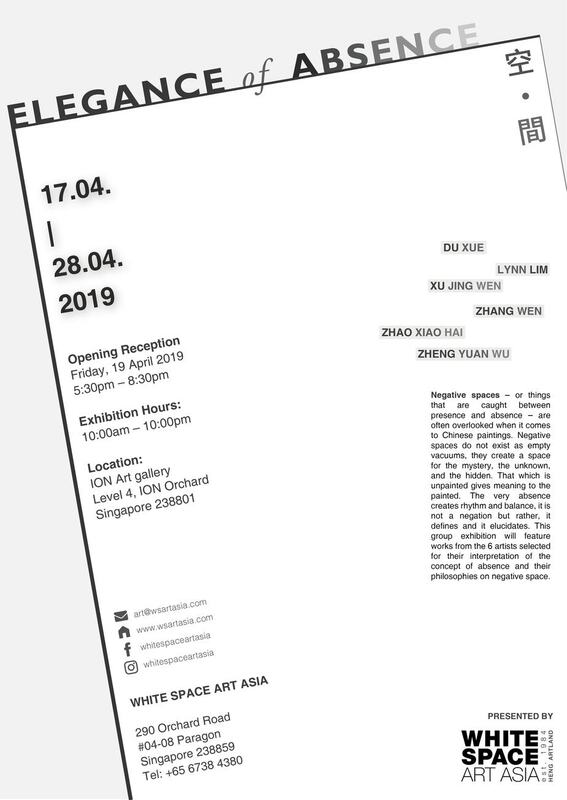 This group exhibition will feature works from the 6 artists (Zhao Xiao Hai, Zhang Wen, Zheng Yuan Wu, Du Xue, Xu Jing Wen and Lynn Lim) selected for their interpretation of the concept of absence and their philosophies on negative space.